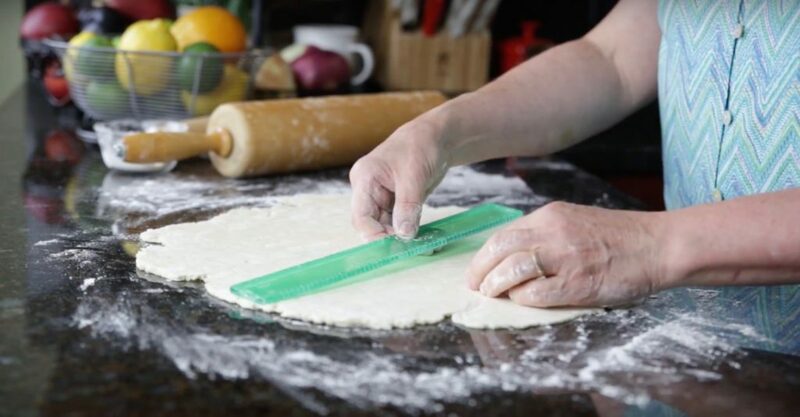 The technique to roll out a pie crust is relatively simple. Follow these simple rules and the pie crust is tender and flaky. Here’s our post on basic pie crust. Here you are instructed to gently handle the dough. The more moisture and agitation (mixing and kneading), the more the gluten develops. This makes the pie crust difficult to roll out, it stretches out and shrinks back. Refrigerate the dough for at least an hour before rolling out to allow the starch to properly hydrate. Also see our post on how to freeze a pie crust. Lightly flour a flat surface to prevent sticking, place the dough in middle and lightly flour the top of the dough and the rolling pin. 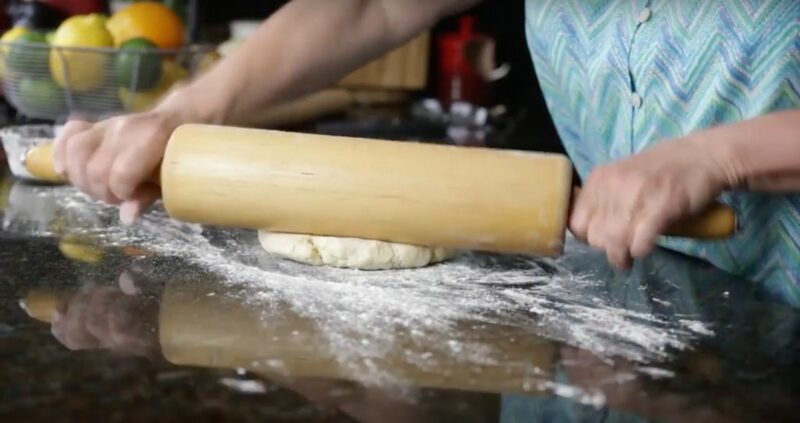 The dough is cold and stiff, so start by tapping on the dough with the rolling pin in different directions, flip, flour and tap again. The dough has flattened a bit and warmed up, now place the rolling pin in the center of the dough and push out away from you. Place the dough in the center and pull towards you. Turn the dough, add a sprinkle of flour, and turn the 90 degrees and repeat. 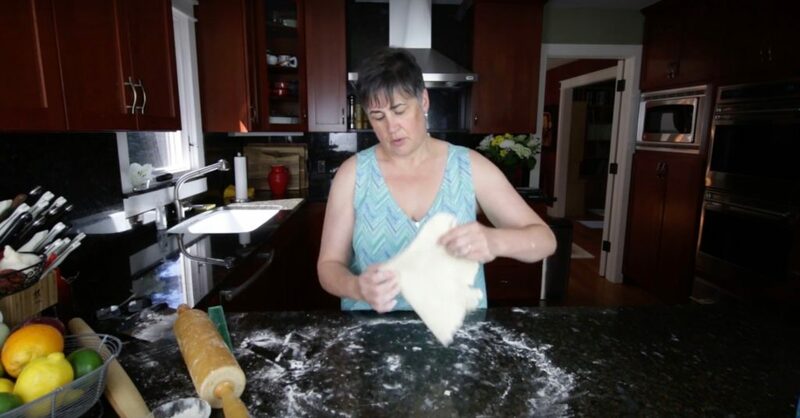 Keep rolling and turning until the dough is a 14-inch round and about ¼-inch thick. Fold the dough in half and in half again. Place the center point in the middle of the pan and reopen. Tuck the pie dough into the pan making sure to leave no gaps at the edges. Trim to 1-inch from the rim of the pan. Don’t discard those scraps – make these delicious pastry treats. For a single pie crust, tuck edges of the dough under and then crimp with your fingers or with a fork to make a decorative edge. For a double pie crust, add filling, trim dough and tuck both top and bottom crusts under and crimp.